I haven't heard that phrase, "One from Column B" for years but Chinese restaurants used to have a menu with 2 or 3 columns of menu items and you would be able to order "one from column A and two from column B." The B column was usually the veggie dishes. Fried rice is an easy, versatile, and quick vegetarian recipe. In fact, the hardest part is remembering to make the rice at least several hours beforehand, so that it has time to chill. It's a great way to use leftover rice, the drier the better. That way the soy sauce flavors the rice but doesn't "soak" into it. If you expect meat eating guests you can serve chicken, pork or shrimp bits on the side for them to add. *If you use chard, there are a few changes: blanch for only 1 minute or when wilted and be sure to squeeze out liquid before using. Heat 1 T oil in wok over high heat. Add the eggs and mix around. When lightly set, break into pieces, then transfer to a bowl or plate. Add remaining oil to wok, then add blanched vegetables and most of the scallions. Stir constantly for one minute, then add rice and soy sauce. Continue stirring, and use the spoon to break up any clumps of rice and mix in soy sauce evenly. When the rice is hot, add eggs, salt, and pepper, stir, transfer to bowl or platter, sprinkle with remaining scallions, and serve. 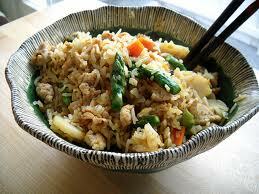 You can use brown or white rice, or a mixture - the key is for the rice to be cold.